Why the WRITING IS ON THE WALL and invest in gold and silver before its impossible to acquire the metal. The once great U.S. Empire is now in big trouble. Cracks are beginning to appear in the once great American Dream as the country’s economic and financial systems are on the verge of an epic collapse. Unfortunately, its citizens will be the last to know as they have totally lost the ability to distinguish between “Illusionary” and “Real” wealth. With the recent take-down in the price of gold, many precious metals investors have become worried once again that they may have invested in a DEADBEAT ASSET. And of course analysts from member banks are now too eager to present charts showing the price of gold only has one way to go… much lower. Sometimes I wonder how these bank analysts sleep at night realizing they sacrificed their profession in order to dish out worthless propaganda. Well, maybe they just don’t have an option or they will turn out like the poor 30,000 that are going to be laid off at Barclays over the next two years. Now, if we estimate the average salary of a Barclays employee (found here) of $70,000 a year and multiply it by 30,000 workers, the CEO will have an extra $2.1 billion to pass around to upper management as bonuses. Nothing like living off the fat of the people. Let this be a warning….. the end of Fiat Monetary Finance is coming. Times are ah-changing. Although one must also appreciate that USA Pension liabilities have a massive shortfall in value which is only increasing, Moody's has it at over 2 Trillion US$ and counting. If we look closely at the chart, we will notice three distinct upward trends. First, there was the continued increase from 1974 until 1999 (tech bubble collapse & 9/11 attack). Second, the next upward trend from 2002 to 2007 (the collapse of the U.S. Investment Banking and Housing Market). Third, the current trend from 2008 to present. As you see, each successive upward trend increased at a much steeper rate. According to the ICI – Investment Company Institute, the total U.S. Retirement Market (2014) is valued at $24.5 trillion compared to $991 billion in 1980. So in 35 years, the U.S. Retirement Market increased a whopping 2372%. Now, either Americans are really smart, or unwittingly foolish. You will notice in the chart I have posted the high price of gold in 1980 at $850 compared to the current price of $1,100. When gold traded at a high of $850 (average of $612 for the year) in 1980, Americans held a total of $991 billion in retirement assets. 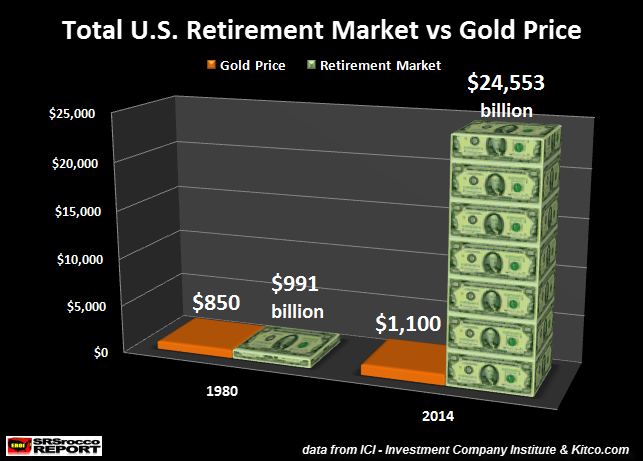 However, the price of gold is now trading at $1,100 while the total U.S. Retirement Market is valued at $24.5 trillion ($24.9 trillion Q1 2015). Here we can see which asset class increased the most in value. If I was included in the 95-98% of Americans invested $24.5 trillion U.S. Retirement Market, I would most certainly feel like I was apart of the winning team. 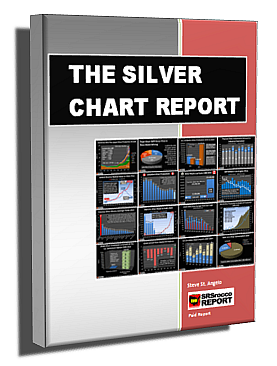 Unfortunately, it’s been a bit rough being a precious metals investors as the prices continue to go in the opposite direction we’d like. But, don’t be too hard on yourself as gold and silver are the real HIGH-QUALITY ASSETS to own , not hyper-inflated Ponzi Schemes. Why? Well, it all comes down to energy. Before you roll your eyes at those six letters E-N-E-R-G-Y, maybe you might pay a little more attention now that precious metal sentiment is in the cesspool. 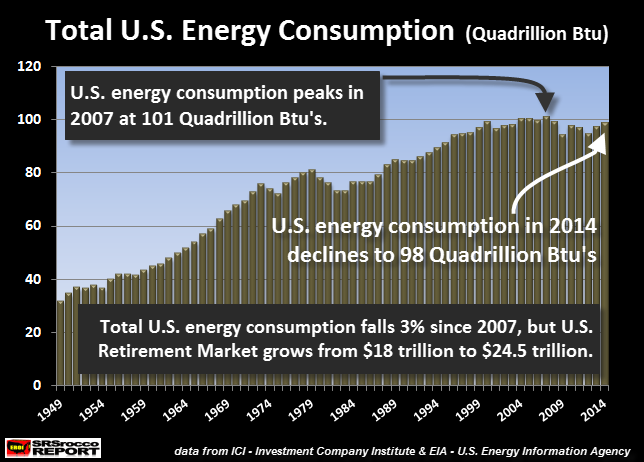 However, total U.S. energy consumption fell from a peak of 101 Quad Btu’s in 2007 to 98 Quad Btu’s in 2014, while the total U.S. Retirement Market grew from $18 trillion to $24.5 trillion. How did the U.S. Retirement Market grow $6.5 trillion while its total energy consumption declined? Anyone who understands economics, realizes that growth is predicated upon an increased energy supply. How can we have a larger economy (and higher valued retirement assets) if total energy consumption falls? Gail Tverberg of Our Finite World put together this chart showing the relationship between world oil production growth and global GDP growth. You don’t have to be too clever to figure out that as the (four-year) percentage rate growth of world oil supply declined, so did the growth of global (and listed countries) GDP. Thus, in order for the U.S. Retirement Market to grow on the back of falling energy consumption, the wizards at the Fed and U.S. Treasury had to manufacture GDP growth by printing money and increasing debt. Because the Fed realizes most Americans don’t understand the difference between debts and assets, they were able to keep them investing in the Greatest Ponzi Scheme in history. We must remember, paper assets such as retirement accounts are CLAIMS ON FUTURE ENERGY CONSUMPTION. Energy has to be burned to create economic activity to allow retirement accounts to be paid back or settled. Furthermore, you need a GROWING ENERGY SUPPLY in order to pay back an even higher valued U.S. Retirement Market. Now, I would imagine there isn’t one Wall Street analyst that will provide this sort of logic to the investing public. Instead, we will continue to see more bearish price forecasts for gold by the bank and brokerage analysts as they continue to pump up the already hyper-inflated U.S. Retirement Market. 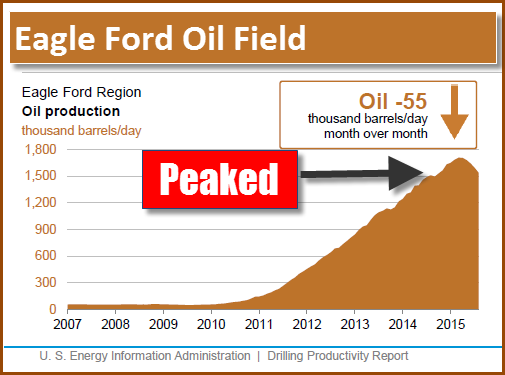 As we can see, the two largest shale oil fields (Bakken & Eagle Ford) have already peaked and declined. Now, the data from the EIA’s Productivity Reports are estimates, but they do provide a good snapshot of the current situation. 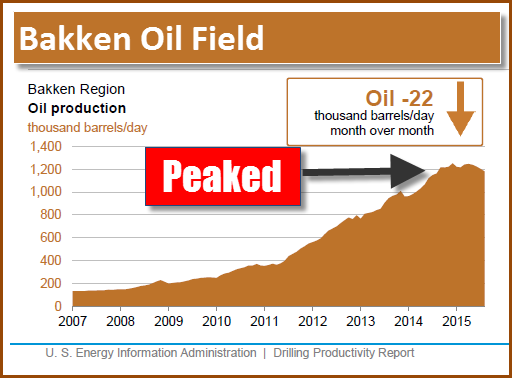 Moreover, oil production data released by North Dakota and Texas show the peak may have occurred in December of 2014. Either way, the Great U.S. Shale Oil Bonanza is heading in one direction… DOWN. That being said, I have seen estimates that U.S. domestic oil production may decline 33% by 2020 and up to 60-70% by 2025. Do you really think the U.S. Retirement Market (currently valued at $24.9 trillion – Q1 2015) will survive as U.S. domestic oil production collapses within 5-10 years? The U.S. Empire is on its last legs. At some point, we will not be able to trade worthless Fiat Dollars for our oil imports. Falling domestic oil production, on top of falling oil imports will wreak havoc on the U.S. Economy and most paper and physical assets. 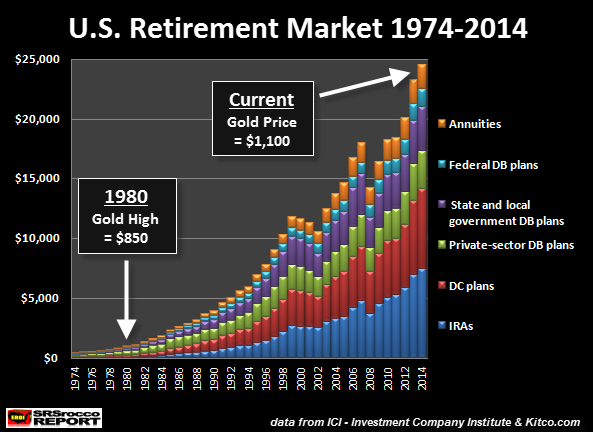 Thus, the collapse of the U.S. Retirement Market will cause an epic surge in the price of gold. This is why it is best to see the WRITING ON THE WALL and invest in gold and silver before its impossible to acquire the metal.